Today, I committed a crime. Well actually, I committed two - trespassing and robbery. 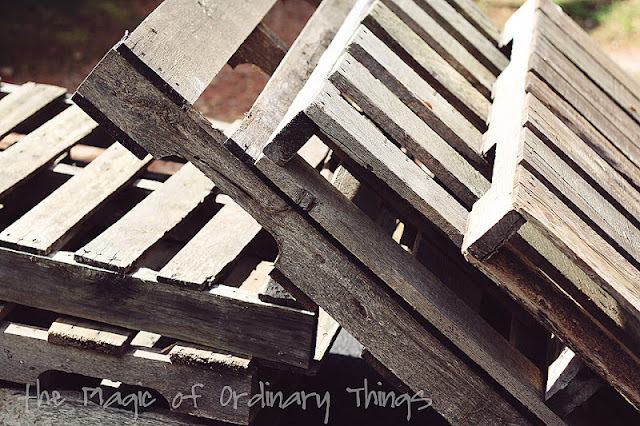 For the last two years I have seen a random stack of wood pallets lying along the side of the road in a field. Was anyone really going to miss them? I decided, NO! So, along with the help of friend, we ignored the No Trespassing sign, and helped ourselves to seven of them. May actually go back for more at some point. Oh, I love pallets! I just stole 2 from the across the street a couple of nights ago... Man, they are heavy!